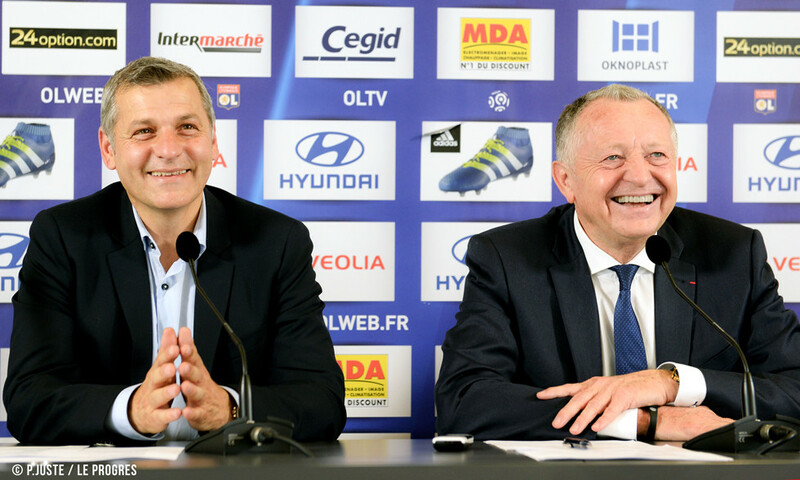 In a press conference at Tola Vologe on Friday, Olympique Lyonnais president Jean-Michel Aulas consolidated Bruno Genesio's position as coach while unveiling a new club organigramme. 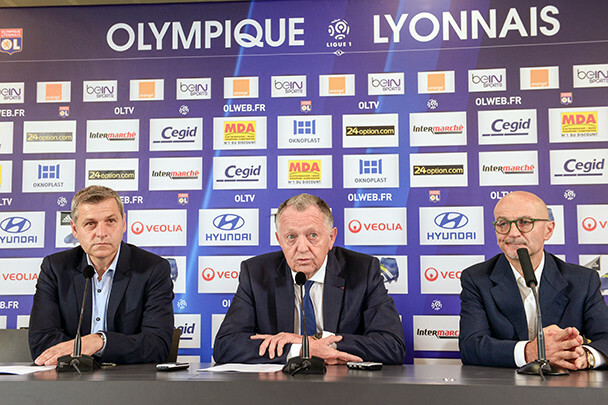 President Jean-Michel Aulas announced a shake-up of duties among the staff at Olympique Lyonnais with a view to achieving objectives in all competitions in the season to come. No surprise that Bruno Genesio's role as head coach will be maintained, the former assistant coach and youth team boss signing a deal that runs through to June 30, 2019. His assistant coach Gérald Baticle also signed a three-year deal while fellow assistants Joël Bats and Claudio Caçapa should also extend their association with the club in the days to come. "I'm very proud to extend my contract," declared Bruno Genesio. "Everyone knows the history I have with this club and I would like to thank Jean-Michel Aulas, Jérôme Seydoux and all the directors. In January, they took a courageous decision - not many people thought it could work. Now I need to confirm the great work done in the second half of last season and attack the new season in the same way. To do that, I put my faith in my staff and my players. We have said that Clément Grenier and Bakary Koné can leave if they want to, but for the rest of the squad, I would like to keep the skeleton intact. I have had some guarantees from the president even though, in football, you never know what will happen." In terms of the staff, the news is the arrival of Antonio Pintus, who is also linked to the club for three seasons, while Gérard Houllier will have a permanent and, in France, exclusive consultant role. "We're very much in snyc," confirmed Jean-Michel Aulas. For the president and his coach, the press conference was also the occasion to cover numerous subjects, including many transfer rumours. Jean-Michel Aulas on Hatem Ben Arfa: "His transfer is a priority for us. I don't know whether we'll be able to pull it off but Hatem's agents visited us today. Among the clubs vying for his signature, we're neither the richest nor the most prestigious, but he has a greater chance of playing Champions League football with OL than he does with PSG or Barcelona. We won't overstretch ourselves but we will do everything we can to persuade him. I spoke to him on the phone and if he follows his heart, he will come to Lyon. We should know his decision by the end of next week." Jean-Michel Aulas on Alex Lacazette: "As I said, we have had several offers, including one of €40m (€36m plus €4m in bonuses). And I responded, 'I say no'. If Alex absolutely wants to leave, we will listen, obviously. But we want ot build a team that can compete with PSG. We need to build on the second half of our league season. For the club, it's also important to be visible on a European level. I repeat: we will do all we can to keep the players that Bruno wants to hang onto. But if there are offers that the players can't refuse, we will take a look and try to replace them as best we can." Bruno Genesio on Nabil Fekir: "He's an OL player. He is under contract with the club and as of Monday, he will be getting stuck into an individual training programme, as he is still getting back to his best after a long injury lay-off. From Monday, he will be in Lyon to looked after by club doctors and a physio. I'll be there too, as he is a fundamentally important player for the club." Jean-Michel Aulas on Rachid Ghezzal: "We just made him an offer he can't refuse. We're following the situation closely; he's an excellent player with a great mentality. I was a fan of his even before he burst onto the scene. He has a good memory and I'm sure he remembers." Bruno Genesio on singing a left-back: "With the departure of Henri Bedimo, who came to the end of his contract, we clearly have to bring someone in. We're satisfied with the season Jérémy Morel had, but we need to have two players for the position. So signing a left-back is our priority now and we’re following four players who played in France and overseas last season." In conclusion, Bruno Genesio gave an outline of the club's pre-season activities. Training will resume on June 23, with the players heading off to Tignes on a training camp from June 26 to July 1. The camp will be followed by a friendly in Bourg-en-Bresse against a new partner club of FBBP (Ligue 2). Five pre-season friendlies have been planned against opponents to be determined. A gala match against a European adversary could take place at the Parc OL on July 30, which would be a great warm-up for the Trophée des Champions against Paris Saint-Germain on August 6 in Austria. Next season OL will be able to count on a new Pro 2 squad, which will be coached by Maxence Flachez with Gilles Rousset and Nicolas Quinault. Grégory Coupet will be the coach for the Pro 2 'keepers and will work in partnership with Sébastien Gerin. "This Pro 2 squad will train at Décines," explained Bruno Genesio. "It will be composed of players born between 1995 and 1998. It will be a real stepping stone to the professional squad, for both the staff an the players. The objective is to improve and, one day, to have youth academy products as 75 per cent of our team." Another arrival is Christian Bassila, who has been named as U12 coach while Cris will head up the U19s. President Jean-Michel Aulas also announced the signature of a first professional contract by Christopher Martins-Pereira and Houssem Aouar (who had been a target for several English clubs).